Orders typically ship the same day...really fast! Expedited Shipping Available. 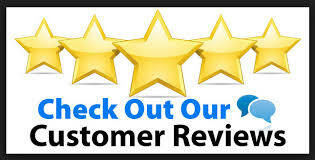 We use low, flat rate, tiered shipping! Same low shipping coast-to-coast. 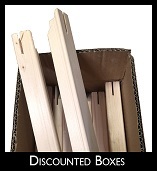 WE SPECIALIZE IN LARGE PALLET ORDERS WITH HUGE DISCOUNTS - CALL US! 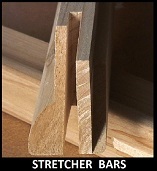 Custom Stretcher Bars made to your specifications. Please call or click here for pricing on custom orders. New Shipment with Lots of Fresh Stock! Please Note: $20 minimum for orders. Shipping surcharge for oversized stretcher bars, Click for info. PayPal Express Customers: Additions & Surcharges charged separately but we'll contact you 1st. 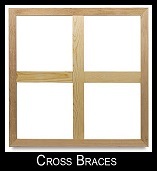 Stretcher Bar Warehouse offers wholesale pricing on five styles of canvas stretcher bars. Our bars are milled from strong, kiln dried pine to preserve dimensional stability. Our friendly crew is here to assist you in selecting the right style of stretcher bar and braces or cross bars to suit your project. With company divisions in high-end giclee printing and a high volume canvas stretching service, we have the experience and knowledge to assist you in making your venture worry free and profitable. Finding custom length stretcher bars for your projects can be difficult. At Stretcher Bar Warehouse we simplify this process by allowing you to order custom sized stretcher bars in metric or fractional inches. This means you will have the exact size necessary for your needs. As our bars are made in house, and in most cases they can be shipped the same day. Our machinery allows us to create the same sleeved connection you are used to, allowing the stretcher bars to be easily joined without any special tools. Our custom bars can be used with any of our other bars of the same style. Call or email, if you need custom sized bars. We look forward to working with you. Copyright © 2014 Stretcher Bar Warehouse. All Rights Reserved. Built with Volusion.